Pizza Hut continues to support America’s Biggest Bedtime Story and Pencil’s of Promise with a celebrity reading a bedtime story each year. 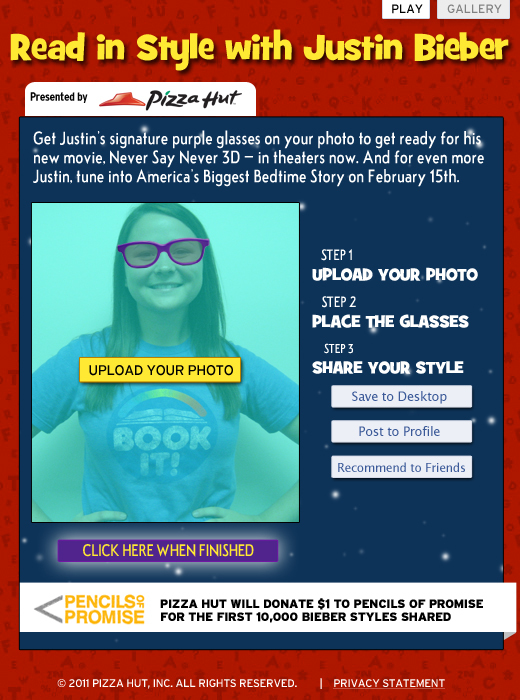 This year’s reader was Justin Bieber and with his movie just about to come out, Pizza Hut went one step further to integrate a Facebook application to help tie the two together and help more of Justin’s fans get exposed to this charity event. When Zeno approached Sparkfactor about building this flash based application there was no doubt that our creative could make the message cohesive along with the application being engaging.